Secretary of State Hillary Clinton faced harsh criticism from Republicans in Congress on Wednesday for misleading statements made by the Obama administration on the terrorist attack in Benghazi that killed four Americans. "Four months or months after the Benghazi tragedy—it's a tragedy when we lose four brave Americans—there are many questions that are unanswered," said Sen. John McCain (R., Az.) during a hearing before the Senate Foreign Relations Committee. "And the answers, frankly, that you've given this morning are not satisfactory to me." McCain asked whether Clinton and President Barack Obama were aware of a classified cable sent by Ambassador Christopher Stevens in August warning that the Benghazi consulate could not sustain an assault. "On the anniversary of the worst attack in American history, Sept. 11, we didn't have Department of Defense forces available for seven hours," McCain said. McCain faulted the administration for refusing to provide the full text of emails regarding the deletion of references to al Qaeda and terrorism in talking points prepared by U.S. intelligence for administration spokesmen. McCain said Obama continued to hedge on whether the attack was carried out by terrorists until Sept. 24 when he told one television interviewer the matter was being investigated. "The president of the United States, as late as Sept. 24, two weeks later, did not acknowledge that this was an act of terror, conducted by people who were at least somehow connected to al Qaeda," McCain said. Asked by Sen. John Barrasso (R., Wyo.) about statements by the president that al Qaeda had been decimated and whether she believed that to be the case, Clinton said: "Well, core al Qaeda certainly has been. I think you would hear the same from the intelligence community or DOD. … What we're seeing now are people who have migrated back to other parts of the world—where they came from, primarily—who are in effect affiliates, part of the jihadist syndicate. Some of them, like Al Qaeda in the Islamic Maghreb, use that name. Others use different names." During an afternoon hearing before the House Foreign Affairs Committee, Clinton was questioned by several Republicans on the apparently false information supplied to the American public by the administration after the attack. Rep. Dana Rohrabacher (R., Calif.) said the administration appeared to blame the United States for the Benghazi attack because it said Muslims had been enraged over an anti-Muslim film. "Over and over and over again it was repeated that we had enraged the Islamic terrorists. … When you say that we enraged the Islamic terrorists, that means we're at fault, they're not at fault—and then to look and see that the only people that I know who are in jail right now is the filmmaker, isn't this a little disconcerting?" Rohrabacher asked. Clinton said in response to a question by Rep. Joe Wilson (R., S.C.) that she did not want to appear on Sunday television talk shows days after the attack to explain what happened because managing the crisis was her priority. "And I believe that part of the priority is telling correct information," Wilson said. "And you could have done that. And I think it's just very unfortunate, the multiple appearances by Ambassador [Susan] Rice with information that's been discovered not to be correct." Asked about promises by Obama to take action against the terrorists who carried out the attack, Clinton said she spoke recently with FBI Director Robert Mueller who told her the investigation of the attack is "proceeding." "I don't know about this committee," she said. "but I certainly hope that the FBI is able to investigate, identify, and hold responsible those who waged this attack against us." Clinton again took responsibility for not providing better security and ignoring requests to strengthen defenses at the facility. "As I have said many times since Sept. 11, I take responsibility," Clinton told the Senate Foreign Relations Committee. "Nobody is more committed to getting this right. I am determined to leave the State Department and our country safer, stronger, and more secure." On the shifting accounts by the administration about the attack, the secretary of state defended the response, claiming she had called it "an attack by heavily armed militants." However, the cause of the attack and the identity of the attackers and their motives was unclear, she said. "The picture remains still somewhat complicated," Clinton said, adding that key questions about the perpetrators "remain to be determined." Clinton and other administration officials initially said in public statements after the attack that the cause was a spontaneous demonstration against an anti-Muslim online video, a theme that critics have said fits the administration’s tendency to blame the United States, and not foreign Islamists, for sparking terrorism. Four Americans, including Stevens, were killed when several dozen armed attackers stormed and set on fire the diplomatic mission in Benghazi. Although the attack was deliberate and coordinated, Clinton said it was not "indicative of extensive planning." A second attack took place at a CIA facility about a mile away. The CIA was reportedly involved in a covert arms program that may have involved shipping arms to Syrian Islamist rebels. The Obama administration for weeks initially blamed the attack on Muslim protests in the region against an anti-Muslim video posted to YouTube. The administration eventually acknowledged that the attack was a planned terrorist strike by a group, Ansar al-Sharia, that has been linked by U.S. intelligence to al Qaeda. "There were so many protests happening and thousands of people were putting our facilities at risk," Clinton said during the hearing. "We now face a spreading jihadist threat," Clinton said. "We have to recognize this is a global movement." U.S. intelligence officials, who are critical of the administration’s mishandling of the Benghazi attack, said that the entire affair was politicized to avoid contradicting President Obama’s statement weeks before at the Democratic National Convention that al Qaeda was on the "path to defeat." The Benghazi attack and other intelligence reports, however, have shown that al Qaeda is making large inroads into North Africa. The terror attack Jan. 16 at a gas plant in Algeria that resulted in the death of 23 hostages is the most recent sign of a resurgent al Qaeda. 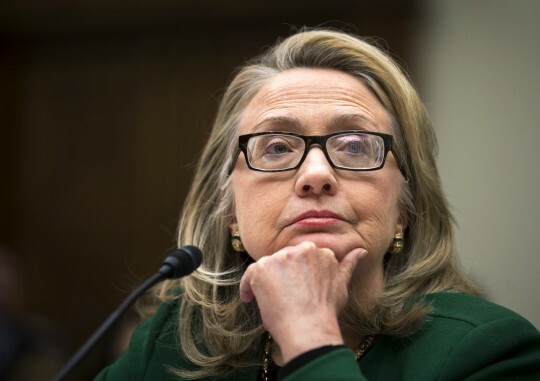 Clinton’s appearance came as questions remained about why State Department officials failed to provide adequate security for the Benghazi facility despite several requests for increased security forces. Security officials repeatedly requested more security forces for the compound but the requests were ignored. Also, the U.S. military failed to have forces ready to defend the mission when it came under attack. A State Department review board report made public last month found "systemic failures and leadership and management deficiencies at senior levels" in the department related to the terror attack. The State Department Accountability Review Board also stated there was never a protest at the diplomatic compound where Stevens and the three other Americans were killed. The others were Sean Smith, Tyrone Woods, and Glen Doherty. The report also contradicted the administration’s claims shortly before the attack that al Qaeda was in decline and noted that the threat is growing. Clinton avoided testimony before the House in November claiming a trip to Australia prevented the appearance. She then suffered a head injury as a result of falling. Clinton said she was not involved in the talking points drafted by the CIA and approved by intelligence and policy officials that played down the al Qaeda links to the attack. The controversy over Benghazi has included charges of CIA politicization of intelligence in a set of talking points used by Rice who appeared on five Sunday television news shows and asserted that the Benghazi murders were the result of a "spontaneous demonstration" by Muslims protesting an online video. The CIA-drafted talking points had been altered to remove references to al Qaeda-linked terrorists in what critics said was an attempt by the White House to down play the terror attack prior to the Nov. 6 election. An intelligence official said the recent al Qaeda attack on the In Amenas gas field in Algeria "presents continued evidence that President Obama lied to the American people prior to the election" when he said al Qaeda was on the decline. "Congress must demand that Secretary of State Clinton and President Obama release all documents involving the Benghazi attacks, and especially, what the mission and activities were of the CIA annex in Benghazi," the official said. "This needs to be an on-the-record and public disclosure so that those involved will be able to come forward with the truth in the event that Clinton and Obama continue to lie." There have been unconfirmed reports that the administration was covertly supplying weapons to Islamists linked to al Qaeda. Obama and Clinton both promised to take action against the terrorists who carried out the attack. However, so far no action appears to have been taken. Ansar al-Sharia, the Islamist militia linked to the deadly terror attack in Benghazi, continues to operate in Libya, according to U.S. officials. Two suspects in the Benghazi attack were arrested in October, including Ali Harzi, a Tunisian linked to the attack. Harzi was detained in Turkey and repatriated to Tunis to face terror charges. This entry was posted in National Security and tagged Benghazi, Hillary Clinton, Middle East, Obama Administration. Bookmark the permalink.